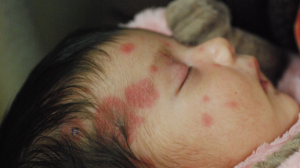 Can you diagnose this case? Curry ZA, Anderson KL, Feldman SR. Digital Papule Consultant. 2019;59(3):93-94. 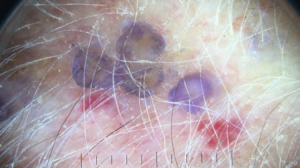 The patient’s medical history was significant for osteoarthritis, and she had a dermatologic history of actinic keratosis, basal cell carcinoma, and seborrheic keratosis. The papule had been present for several months. It was asymptomatic, without ulceration, discharge, pain, or functional limitations. 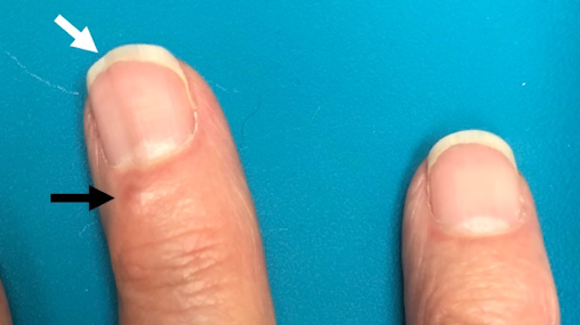 The patient was concerned about potential malignancy and nail dystrophy. No imaging or diagnostic tests were conducted. A clinical diagnosis of digital mucous cyst (DMC) was made. After discussing the diagnosis and treatment options, the patient opted for observation. Because the differential diagnosis of digital tumors is broad,20 it is important to exclude malignant tumors, which was our patient’s concern. Transillumination increases the likelihood of a DMC versus a solid tumor. Ultrasonography, MRI, or biopsy can aid if the diagnosis is uncertain, particularly in cases with a subungual presentation. Malignant lesions can present in the digit. 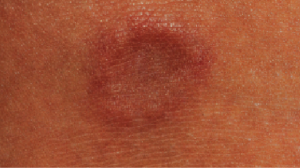 Nodular basal cell carcinoma can present as pink papules with telangiectasias21 mimicking a DMC. Squamous cell carcinoma can present with erythema or scaling papules or plaques.22 Periungual squamous cell carcinoma is associated with human papillomavirus infection and often presents as treatment-resistant verrucae.23 Melanoma typically presents as a macule with irregular borders and multiple colors.24 However, biopsy may be needed to exclude amelanotic melanoma, which can present as an erythematous macule or plaque.24 Benign lesions of the digits with periungual presentation include verrucae and pyrogenic granulomas. 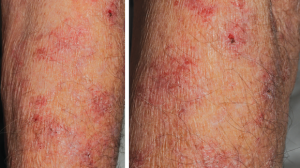 Verrucae are often found on the hands with heterogenous coloration (mosaic pattern) and vascular structures including dotted and looped vessels visible with dermoscopy,25 which can mimic DMCs. 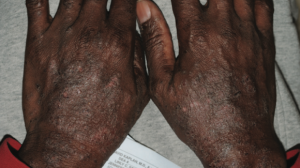 However, hyperkeratosis is more likely with verrucae.25 Pyogenic granulomas can be associated with mechanical trauma of the digit but often present as exophytic ulcerated masses that are highly vascular,26 in contrast to a DMC. Proper diagnosis of DMCs based on clinical presentation can avoid unnecessary testing and properly exclude both malignant and benign digital lesions. 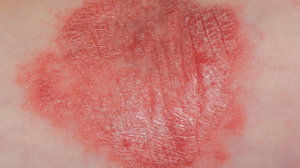 While there are a variety of options for treating DMCs, patients may elect conservative management of asymptomatic lesions following education and reassurance. 1. Drapé JL, Idy-Peretti I, Goettmann S, et al. MR imaging of digital mucoid cysts. Radiology. 1996;200(2):531-536. 3. Salerni G, Alonso C. Digital mucous cyst. N Engl J Med. 2012;366(14):1335. 4. Fernandez-Flores A. Transepidermal elimination of mucin is a very common but not yet reported phenomenon in digital myxoid cysts: a study of 35 cases. J Cutan Pathol. 2015;42(12):947-977. 5. Lin Y-C, Wu Y-H, Scher RK. Nail changes and association of osteoarthritis in digital myxoid cyst. Dermatol Surg. 2008;34(3):364-369. 7. Hernández-Lugo AM, Domínguez-Cherit J, Vega-Memije ME. 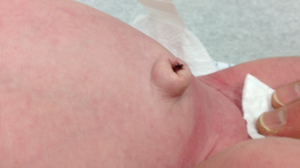 Digital mucoid cyst: the ganglion type. Int J Dermatol. 1999;38(7):533-555. 8. Kim EJ, Huh JW, Park H-J. Digital mucous cyst: a clinical-surgical study. 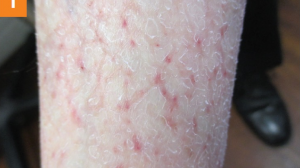 Ann Dermatol. 2017;29(1):69-73. 9. Connolly M, de Berker DAR. Multiple myxoid cysts secondary to occupation. Clin Exp Dermatol. 2006;31(3):404-406. 10. Goldman JA, Goldman L, Jaffe MS, Richfield DF. Digital mucinous pseudocysts. Arthritis Rheum. 1977;20(4):997-1002. 11. Freire V, Guérini H, Campagna R, et al. Imaging of hand and wrist cysts: a clinical approach. AJR Am J Roentgenol. 2012;199(5):W618-W628. 12. Balakirski G, Loeser C, Baron JM, Dippel E, Schmitt L. Effectiveness and safety of surgical excision in the treatment of digital mucoid cysts. Dermatol Surg. 2017;43(7):928-933. 13. Epstein E. A simple technique for managing digital mucous cysts. Arch Dermatol. 1979;115(11):1315-1316. 14. Weinheimer K, Patrick N, Darowish M. Treatment of distal interphalangeal ganglion cysts by volar corticosteroid injection [published online December 14, 2017]. Hand (N Y). doi:10.1177/1558944717744336. 15. Lonsdale-Eccles AA, Langtry JAA. Treatment of digital myxoid cysts with infrared coagulation: a retrospective case series. Br J Dermatol. 2005;153(5):972-975. 16. Karrer S, Hohenleutner U, Szeimies R-M, Landthaler M. Treatment of digital mucous cysts with a carbon dioxide laser. Acta Derm Venereol. 1999;79(3):224-225. 17. Kim JH, Park JH, Jee H, Oh SH. Successful treatment of recurrent digital mucoid cysts using a 1,444-nm neodymium-doped yttrium aluminum garnet laser. Dermatol Surg. 2011;37(10):1528-1530. 18. Esson GA, Holme SA. Treatment of 63 subjects with digital mucous cysts with percutaneous sclerotherapy using polidocanol. Dermatol Surg. 2016;42(1):59-62. 19. Mesa-Álvarez L, Salgado-Boquete L, Flórez-Menéndez MÁ. An 18-month follow-up of digital myxoid cysts after therapy with percutaneous sclerotherapy with polidocanol. Dermatol Surg. 2018;44(1):140-142. 20. Longhurst WD, Khachemoune A. An unknown mass: the differential diagnosis of digit tumors. Int J Dermatol. 2015;54(11):1214-1225. 21. Marzuka AG, Book SE. Basal cell carcinoma: pathogenesis, epidemiology, clinical features, diagnosis, histopathology, and management. Yale J Biol Med. 2015;88(2):167-179. 22. Prieto-Granada C, Rodriguez-Waitkus P. Cutaneous squamous cell carcinoma and related entities: epidemiology, clinical and histological features, and basic science overview. Curr Probl Cancer. 2015;39(4):206-215. 23. Riddel C, Rashid R, Thomas V. Ungual and periungual human papillomavirus-associated squamous cell carcinoma: a review. J Am Acad Dermatol. 2011;64(6):1147-1153. 24. Higgins HW II, Lee KC, Galan A, Leffell DJ. Melanoma in situ: part I. Epidemiology, screening, and clinical features. J Am Acad Dermatol. 2015;73(2):181-190. 25. Li X, Yu J, Thomas S, Lee K, Soyer HP. Clinical and dermoscopic features of common warts. J Eur Acad Dermatol Venereol. 2017;31(7):e308-e310. 26. Piraccini BM, Bellavista S, Misciali C, Tosti A, De Berker D, Richert B. Periungual and subungual pyogenic granuloma. Br J Dermatol. 2010;163(5):941-953. Kathryn L. Anderson, MD Center for Dermatology Research, Department of Dermatology, Wake Forest School of Medicine, Winston-Salem, North Carolina. How would you diagnose this man’s persistent scrotum itching? How do you treat this asymptomatic lesion? 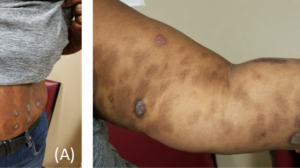 Could statins or ibuprofen causing this women’s arm lesion?